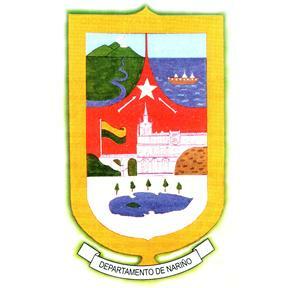 In the site of the Governorship of Nariño, there is a picture of the flag at <www.gobernar.gov.co> (clicking on "SIMBOLOS"). This is a horizontal bicolor yellow over green. Same flag appears also at <ipitimes.com> with description in Spanish: "Autor: Ignacio Rodríguez Guerrero. La bandera está integrada por dos franjas horizontales: amarilla la primera y verde la segunda. De conformidad con las leyes de la heráldica el AMARILLO representa magnanimidad, clemencia, generosidad, riqueza, amor, poder y constancia; el VERDE honra, abundancia y fertilidad. Los nariñenses, con el amarillo significamos la riqueza de las minas, las espigas en sazón y los corazones palpitantes de patriotismo. Con el verde exaltamos la fecundidad de los campos y la esperanza que cada día florece en los horizontes surianos". According to <www.ciudadsorpresa.com>, the flag is Green over Yellow. The ratio 1:2 as in this site does not follow the rest of Colombia's 2:3 flags. I think that the web image was solely to give a general idea of the flag colors, and that it should be 2:3. Based on Presidencia site, the flag is Red over Green. Authors: Guillermo Narvaez D. and Teodulo Camacho C.